I don't use hairspray all that often but when I do, I look for something with a firm hold that doesn't leave a sticky residue yet doesn't leave me with helmet hair either, oh and something to add shine would be nice too but we can't have everything we ask for, now can we? Macadamia Control Hairspray from the makers of my beloved Macadamia Healing Oil Treatment (review here) promises a: "fast drying working spray"
No big claims, no fuss, it's not touting to be the next miracle cure for hair so I had high hopes it would do what it said on the tin. And for once, it actually is in a tin. Well, aluminium canister to be more precise, but who's keeping track! 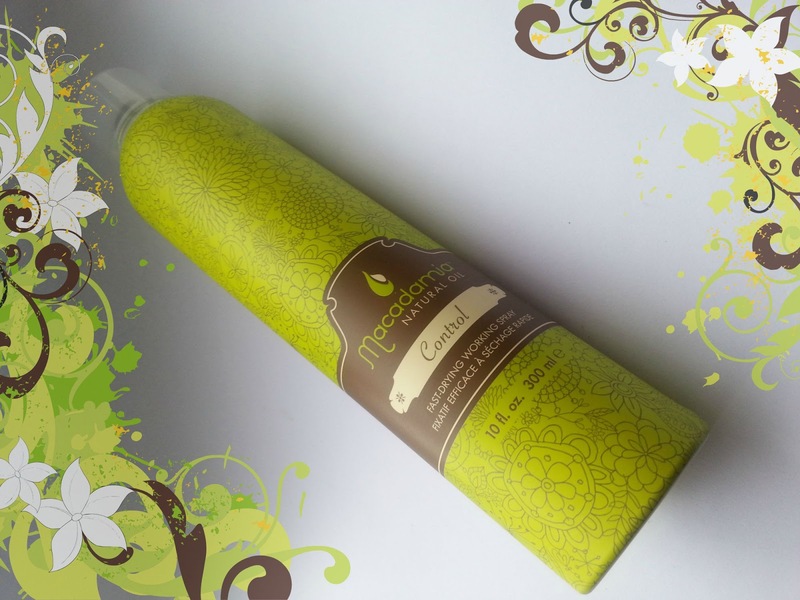 It comes packaged in a decent sized 300ml and is ornately decorated with the Macadamia Hair Co's signature brown and green motif giving it an Earthy, bohemian vibe. I like. 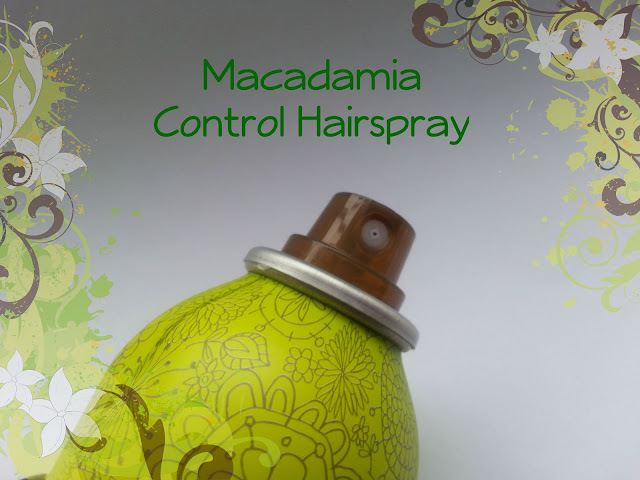 It features your standard Hairspray nozzle and gives a nice big spray. Honestly, the amount of times I've had Hairspray in the past where the nozzle would leak, or the plastic button would become wobbly and detach itself, or it would just release a drizzle of spray.. well, let's just say that this provided no such issues and was a piece of cake to use. It actually feels rather sturdy and well made. In preparing to write this review I've been humming and hawing over any flaws or cons I could possibly come up with to give you guys a fair and balance review and honestly, I can't think of any. 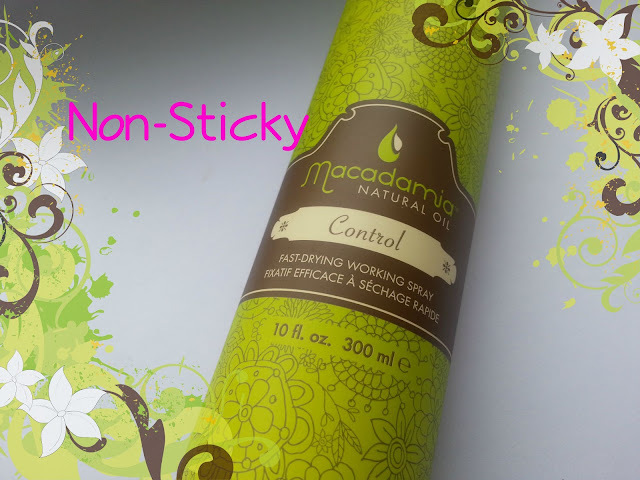 It well and truly does what it says on the tin and it offers no fuss, firm hold that will keep your 'do in place all day without leaving it sticky nor did it have any issue with flaking residue as I've experience with other brands in the past. I have a Remington Pearl Wand that I've had for about 2 years now but I'm ashamed to say that I've only used once - I've never had much luck with curling my hair, the curls always seem to fall flat within 20 mins or so of curling them so in the name of putting this to the test I decided to see how this would fare when it came to holding a curl - which for me is a HUGE thing! Can I get a round of applause please? Yup, this baby did the job perfectly! OK, I admit, I nearly did end up with something resembling ringlets at the starts - but this was my fault - however after gently teasing them out then giving them a quick brush, I gave my hair a good spritz the Macadamia Control Hairspray and YAY curls! They lasted the whole night - and would you believe it, into the next day too. Something which I could NEVER lay claim to before. The use of the Pearl Wand in conjunction with this seemed to do the trick for me anyhow so I'm more than impressed. Best of all - no stickiness! AND my curls could bounce and well, my hair generally had some movement - y'know how some Hairsprays whilst firm holding, can basically turn your hair into something akin to cement? Nope, not with this! Firm hold but lots of bounce and flexibility too! Whilst this may not become a hair staple of mine, in the sense that I don't reach for hairspray everyday, it's certainly something that I will use and replace as and when the opportunity arises. Actually, come to think of, I just may start rocking the curly look / loose waves thang a bit more now that I know I can actually get them to hold with this handy hair saviour! If you're looking for a new hairspray you can't go wrong with this. 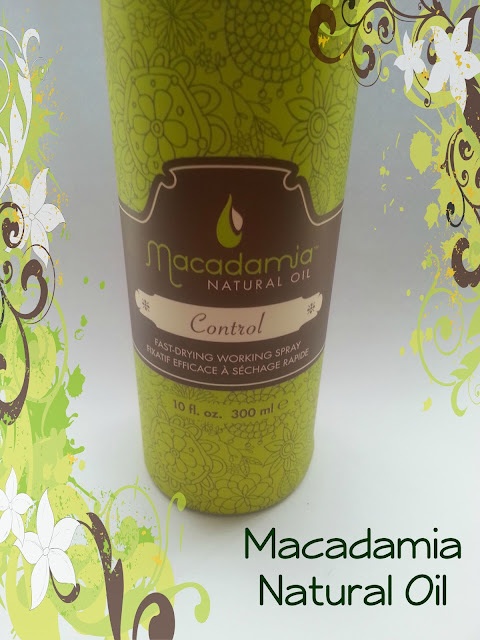 It's also great for using if you're backcombing your hair or just want to gently tease it to get a puffy / bouffant look. Pricewise - It is on the pricier end of the scale, however if you're not a big user of hairspray in general, this 300ml bottle should last you quite some time. 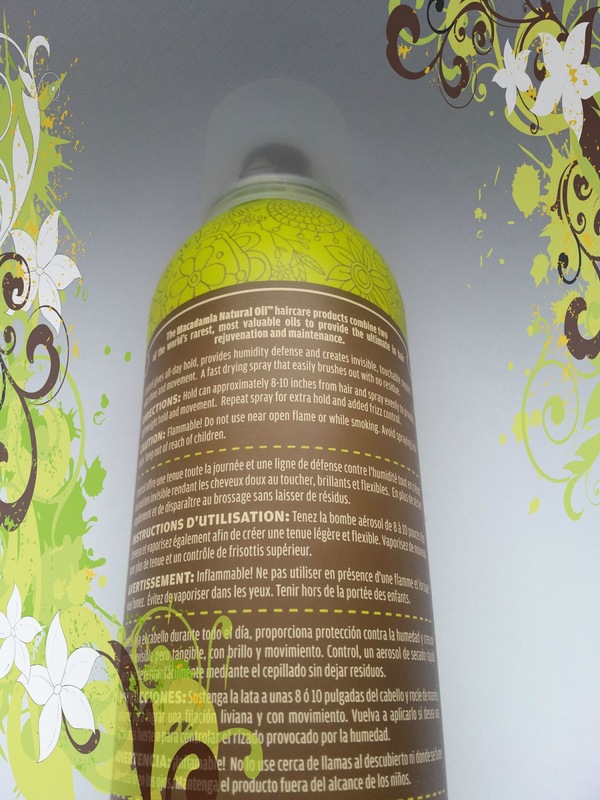 Also it has the benefit of the addition of Macadamia Oil (which is super nourishing for your hair) and it claims to offer some level of natural UV protection. What level of SPF it offers, I don't know, but there's some in there.